It’s that time of year again, where pumpkin seeds make an appearance at our house. I could seriously eat pumpkin seeds all year long, but I refrain so they are a special treat this time of year. 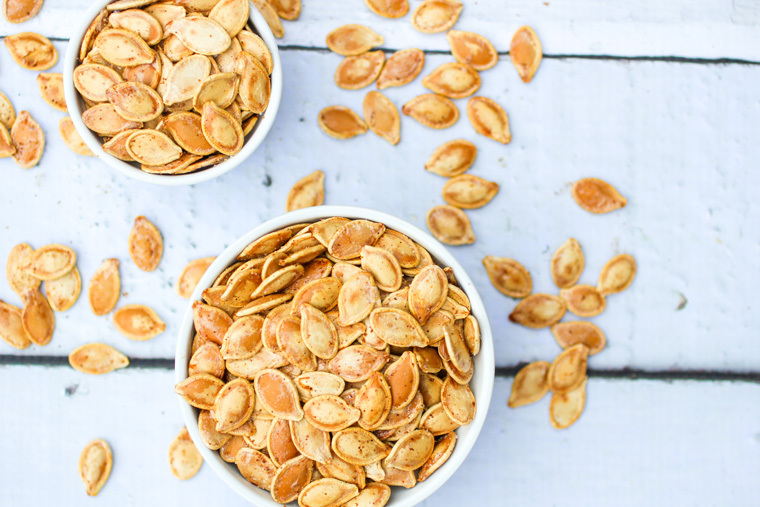 These Easy Spiced Pumpkin Seeds are our favorite, and take no time at all (aside from the drying time, but there are ways to cut that down too). 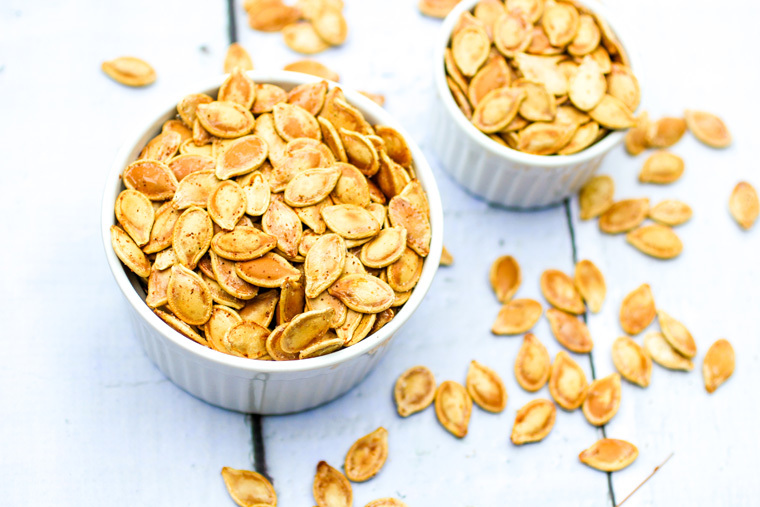 The thing about these Easy Spiced Pumpkin Seeds is that they are a great jumping off place for whatever you’d like to do to them. Sprinkle with herbs, seasoning salt, creole seasoning, cinnamon – whatever you feel like creating. But use this base recipe which is incredible all on it’s own, but then you have the ability to take it to the next level. 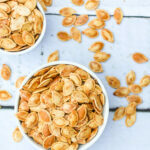 One thing I want you to consider when making these Easy Spiced Pumpkin Seeds is that there are a lot of variables that go into this recipe that can affect the outcome a little. First, humidity in the area you live in, can cause them to take longer to dry out which means a few minutes longer cooking time. Some people don’t want to wait for the full 24 hours of drying time, which is completely fine, but then you will need to adjust your cook time accordingly and you can sometimes end up with crispy on the outside and quite chewy on the inside. So if you like them that way, go for it. It’s all about doing what you like and what your family likes. We usually buy loads of castoff pumpkins towards the end of the season, then remove the seeds from them. 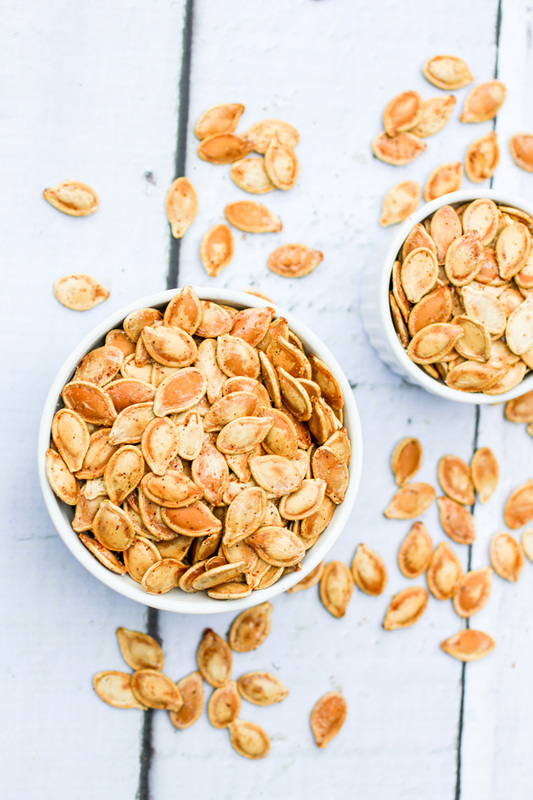 We make up dozens of different types of batches of these pumpkin seeds with different seasonings and spices – both sweet pumpkin seeds and savory pumpkin seeds. Then we fill up a mason jar with a little gift tag that says “Happy Fall” and then give them to our friends and neighbors. 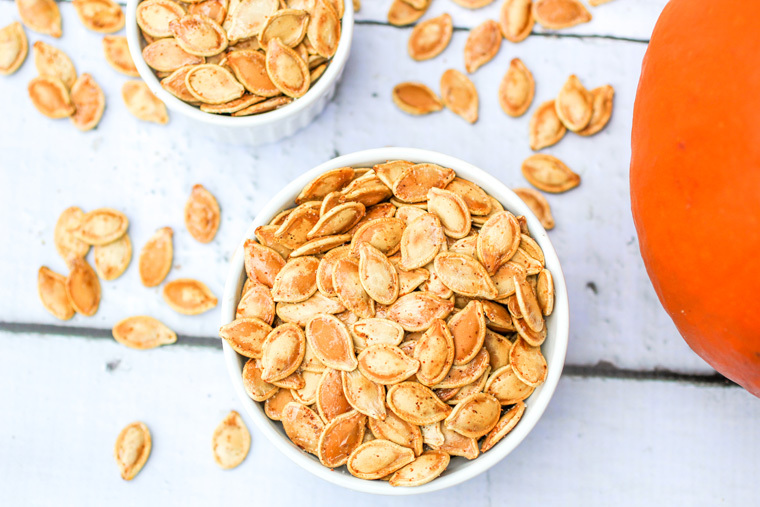 Everyone raves about this Easy Spiced Pumpkin Seeds recipe and once you make it, you will totally see why. 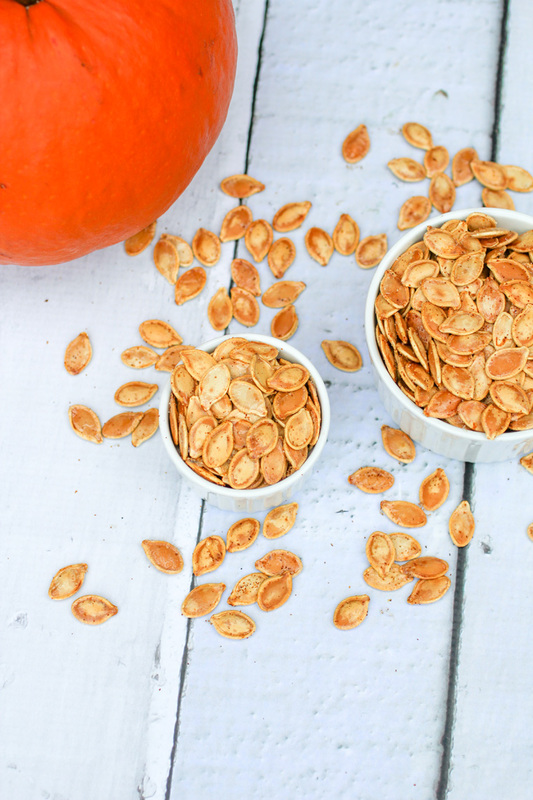 Who wants to make Easy Spiced Pumpkin Seeds? A few years back I learned this trick about boiling the seeds in salted water. It helps to truly get them clean and makes them easier to dry out after. So boil your seeds in salted water for 20 minutes in a pot. Drain them in a colander and then move to the next step. There are several ways to dry out your seeds but the best way is to pour them out onto dry cookie sheets and let them sit and dry for 24 hours. Don't let them clump together, make a single layer so they dry out faster. If you want, after about 12 hours, you can shake the pan a little to get them to flip and spread them out again but that step isn't necessary. In a small bowl, combine the garlic powder, salt and creole seasoning if desired. Toss the seeds into a large bowl with the butter and garlic/spice/salt. Spread evenly on a cookie sheet or two.